The globalization of the national food markets raises a number of difficult legal and political problems. In response, national governments have adopted a wide range of regulatory measures which are not only aimed at the protection of the environment and human health and safety but may also constitute attractive vehicles for protectionism. The Agreement on the Application of Sanitary and Phytosanitary Measures (SPS Agreement) was therefore specifically designed to regulate possible abuses of sanitary and phytosanitary (SPS) regulations. Although, the most important part of the SPS Agreement relates to risk assessment disciplines, this article argues that it is legitimate to speak about risk management dimension of the Agreement. The substantive analysis of the SPS Agreement shows that these disciplines can be identified while their recognition helps to link the text of the Agreement with the practice of national regulators and documents of international standard setting bodies. The article begins from the discussion of basic principles of risk analysis, including risk assessment, risk management and risk communication. In order to background the following discussion, it examines relevant passages from EC - Hormones, case which materially shaped the understanding of risk management disciplines of the SPS Agreement. 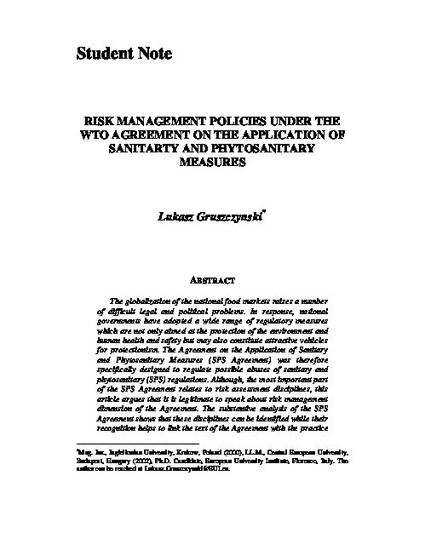 Then the author analyzes the relevant provisions of the Agreement, including concept of an appropriate level of protection as well as specific risk management disciplines, finding some developments of the case law disappointing. On that basis, the author attempts to draw overall conclusions on the risk management dimension of the SPS Agreement, noting that the overall assessment of the SPS Agreement as far as risk management is concerned will only be possible after they are addressed in the case law.